Tiger Zinda Hai: Salman Khan And Katrina Kaif 'Swag Se Karenge Sabka Swagat.' Ready To Groove? The stills and then the trailer of Salman Khan and Katrina Kaif's forthcoming film Tiger Zinda Hai had already made the wait so difficult. And now, team Tiger Zinda Hai, teased us with yet another rocking picture of Salman and Katrina from the film's upcoming first song, titled Swag Se Karenge Sabka Swagat. 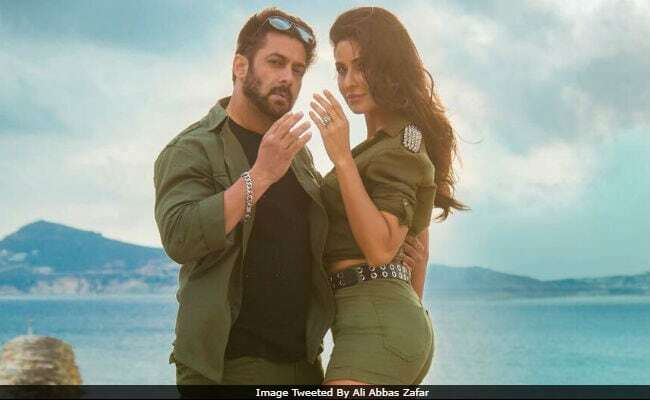 In the picture shared by director Ali Abbas Zafar, Salman and Katrina, colour-coordinated in olive green, do salaam, and look just perfect with each other. "Get ready to groove #SwagSeKarengeSabkaSwagat. Coming soon. @TigerZindaHai," Mr Zafar wrote. (Folks, are you ready to groove? We are all set, happily). The post suggests that Swag Se Karenge Sabka Swagat is the song for which Salman and Katrina went to shoot in Greece. Meanwhile, here's the picture we are talking about. (Liked it? Of course, you did). Seen Tiger Zinda Hai trailer yet? Tiger Zinda Hai is a sequel to Salman and Katrina's 2012 blockbuster Ek Tha Tiger. Both the stars will reprise the roles - a RAW official Tiger and a Pakistani secret agent named Zoya - respectively. Tiger Zinda Hai is Salman Khan's second film directed by Ali Abbas Zafar. He previously made 2016's Sultan with the 51-year-old superstar. Tiger Zinda Hai and Sultan are produced by Yash Raj Films. Tiger Zinda Hai is scheduled to hit the screens on December 22.